Celebrate Banned Books Week...Even at the Elementary Level! 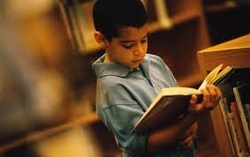 While younger students are just beginning to explore how reading can be a window to the world, they must also understand, even at the most basic level, that there are people who don't necessarily agree with what is in a book. Please review the activities below, which are categorized according to their appropriate grade level. There are also links to Banned Books Week resources and materials. Enjoy! 1. 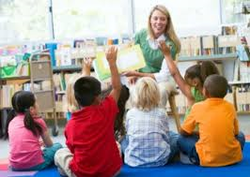 Have a discussion about times when each student has not liked what one of their friends said on the playground or in the classroom. How did it make them feel? Just like we can disagree with what our friends say and think, children and grown-ups can disagree with what the author of a book writes about. Have students write 2-3 sentences and draw a picture about how they would feel if their favorite book was taken away from the library. 2. Students are given a piece of construction paper that says "I like reading because..." They finish the sentence and draw a picture of their favorite book. 1. Write a class letter to the principal about why they like to read and why it isn't fair to take books away from our library and classrooms. Include a class picture with each student holding their favorite book. 2. 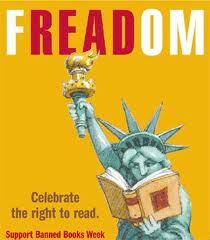 Briefly discuss the First Amendment and how it relates to Banned Books Week. The First Amendment was written to give each of us our basic freedoms. We are allowed to think and say what we want, even if other people don't agree with us. We are allowed to challenge books. At the same time, we are allowed to celebrate the books that have been taken away from some libraries and schools. 1. Discuss why it is important to look at both sides of an opinion. Create a class Venn Diagram about the risks vs. rewards for reading banned books. The middle section of the diagram is a blend of both the risks and rewards. Post the Venn Diagram somewhere near the entry of the library. 2. Discuss the freedoms we have under the First Amendment. Create a comic strip that celebrates the First Amendment. 1. Create a video of students reading from their favorite banned/challenged books. Post the video on the school library website. 2. Have students help in creating a class display. Have them complete the analogy: "A room without books is like..." Then they create a poster, bulletin board, or other visual display that brings the analogy to life. 1. Celebrate characters from banned books. Students choose their favorite banned book and dress up as one of the characters. Then they give a speech as their character explaining who they are and why they shouldn't be banned. 2. Construct a "graffiti wall" made of large pieces of white construction paper. Students are free to write their thoughts about censorship and book banning. Hang the construction paper on a wall in the library or just outside the library. 1. In order to form their own opinions about a controversial topic, students must first understand the "for" and "against" opinions. Hold a debate within the library. One side will be in support of reading all books and making their own decisions, while the other side will argue why books should be screened and approved by parents and the school board. 2. Students create a First Amendment "rap" that explains the five freedoms that are protected under this Amendment. Please click the buttons below to access the web pages. The content in this video is a great example for kids of how some people misunderstand what banning books is all about. A great video that focuses on the perspective of authors on banning books. A good follow-up explanation would help young students understand why authors don't agree with banning books. Check out this video made by patrons and staff of Bookmans, an independent bookstore in Arizona. It was created for the 2012 Banned Books Week Virtual Read-Out.